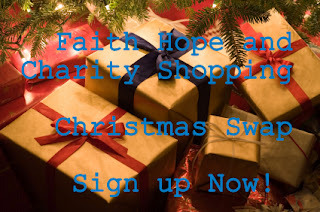 Some of you will recall that mid-2012 I participated in the Jubilee swap hosted by the Faith, Hope and Charity Shopping blog – I’d been tipped off by Julie from Anglers Rest. I had a ton of fun and was partnered up with Ms Dormouse from View from the Teapot in France who tipped me off that the Christmas swap is now open. You can read more about my Jubilee swap here. This time it’s the Christmas swap – why not have a look and see if it appeals to you? You can state whether you are willing to post within your own country or overseas and these are the rules (neither onerous or expensive). You should send your swap partner a minimum of 3 items, and max of five. At least one item should be hand made (by someone if not by you). One item MUST relate to a Christmas carol or song: It’s up to you to interpret this. Sign up closes 28th October 2012. Why not join in and have some fun? This entry was posted in Blogging and tagged Faith Hope and Charity Shopping Christmas Swap by cassmob. Bookmark the permalink.